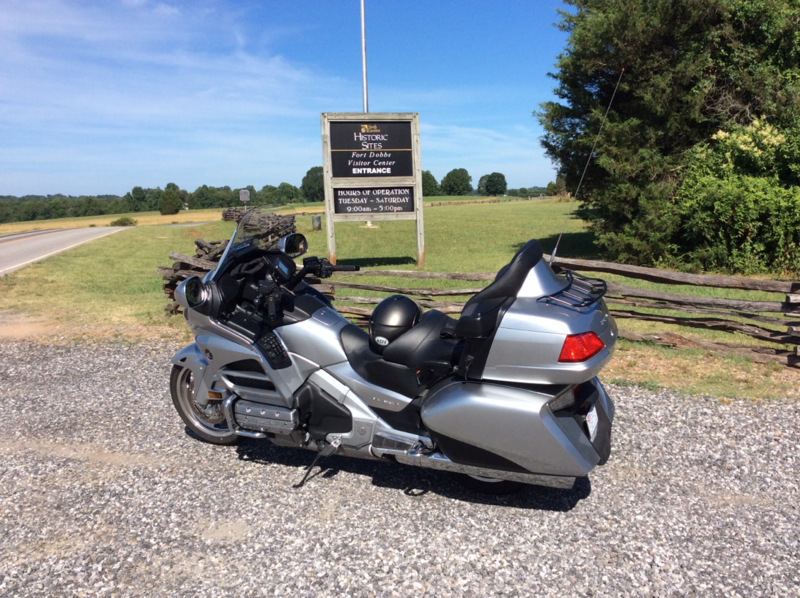 Discussion in 'Ride Reports - Day Trippin'' started by BluRidgeRider, Aug 13, 2013. 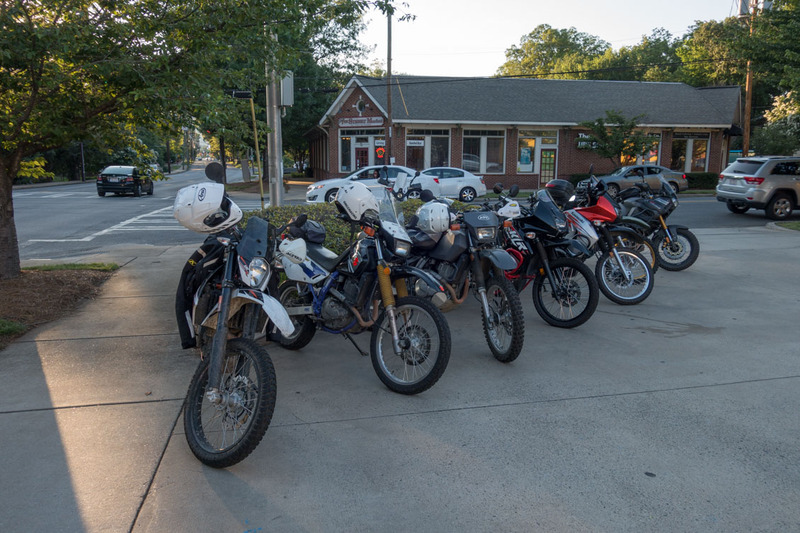 We had a small, but nice turnout for our third Thursday meet at Hawthorne's this past week. Nine riders showed up including the group's founder JoeyBones who now lives in Tampa, Florida. 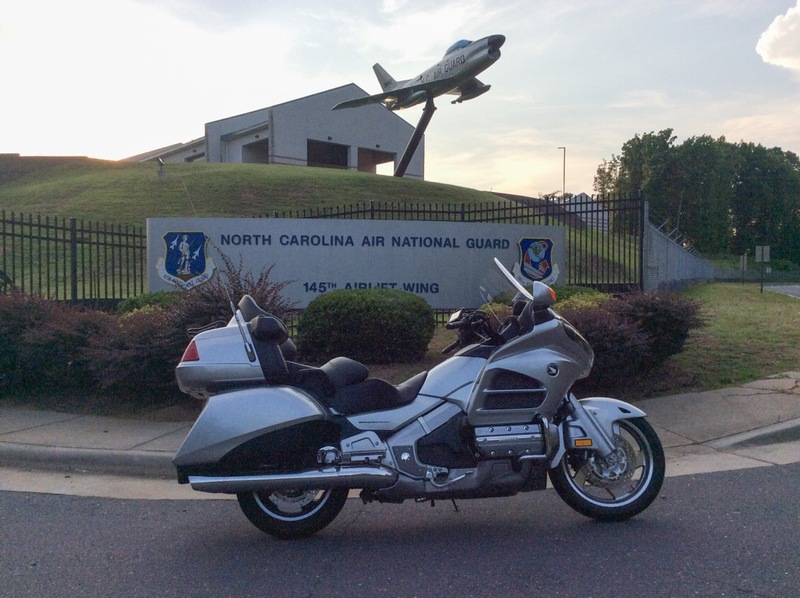 Joe was in Charlotte on business, stopped by for a visit and to drop off some motorcycle parts to Jon. Almost all of the bikes present were thumpers. 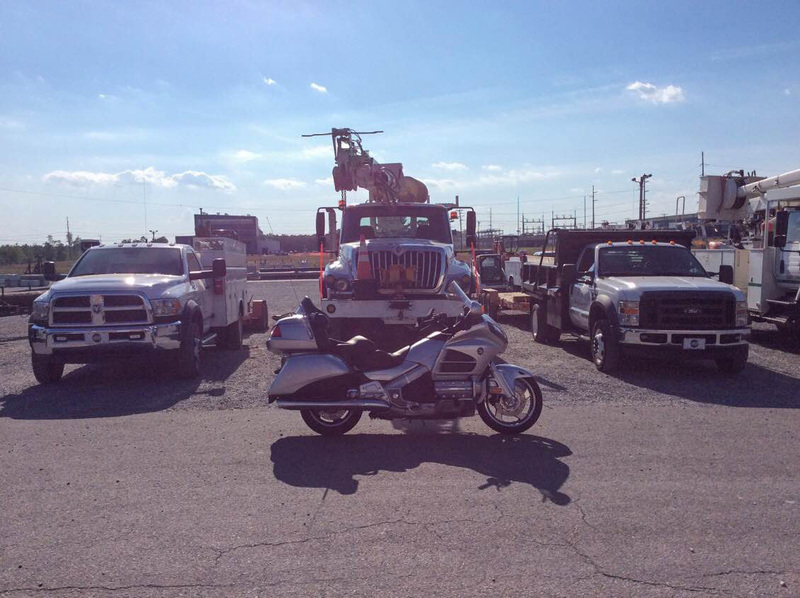 The Super Tenere parked at the far end of the line was the only multi. It was good seeing Joe and hanging out with the guys. ...my buddy Loren teased me about not bringing along my pogo stick. Which is exactly what I was thinking I would have needed to get a good shot. That got me to thinking more about it during the work week and wondering if there was a way to carry it on the bike. Here is the result. It's close to my right leg, but workable. Rode a nice loop that passed back through Hawk's Nest. 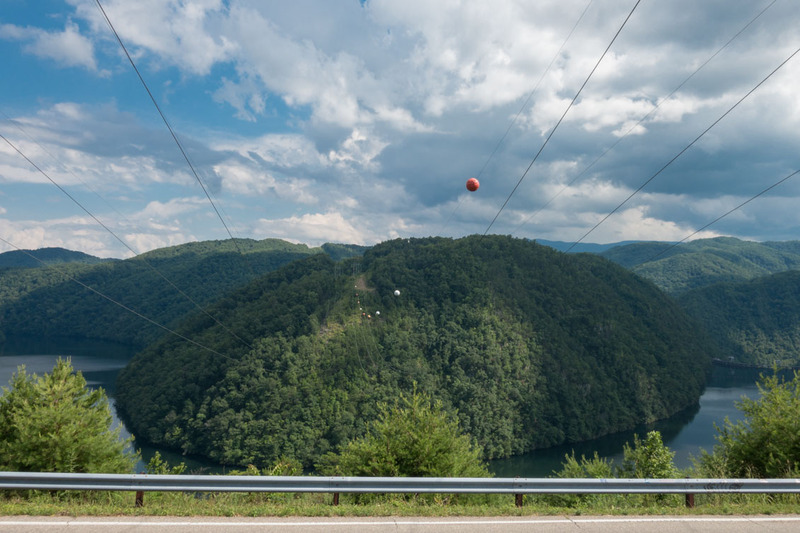 But overhead power lines were in the exact spot that would have made for a good photo. 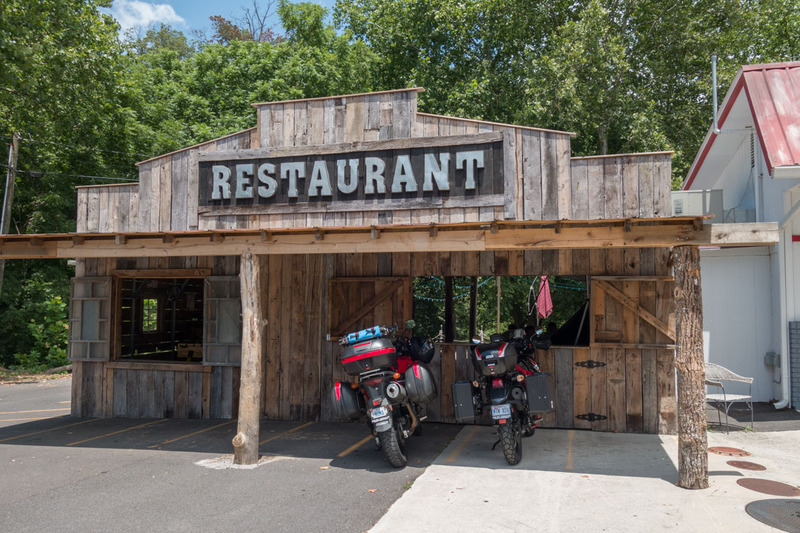 Passed on that shot and rode through Barnardsville stopping for lunch at D&D. 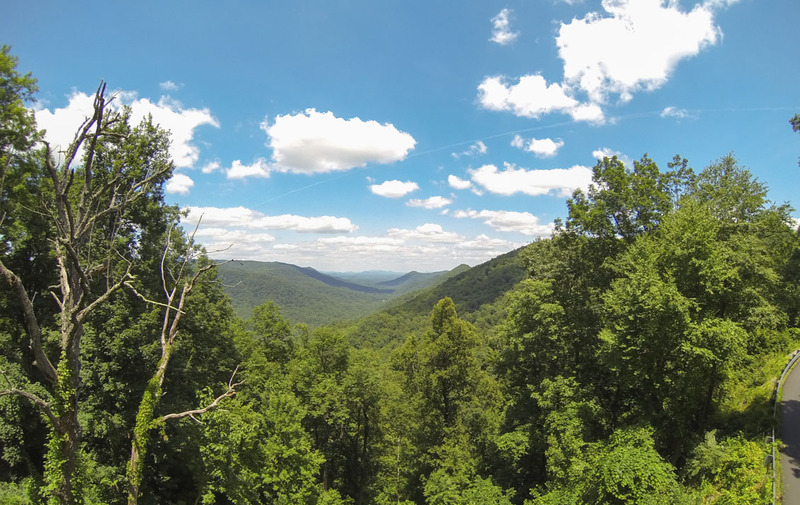 Looped down south of Asheville at stopped at the top for Green River Cove Road. 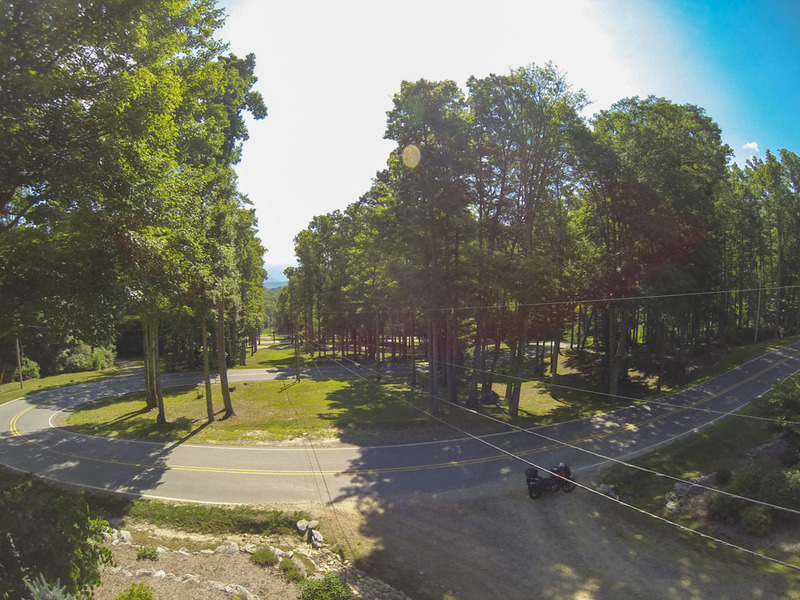 Here's a shot from my GoPro at head height. And here's standing at the exact same spot with the pogo stick raised. Finished the run across Green River Cove Rd, through Mill Spring and then back to Charlotte. Will not make a habit of taking along the pogo stick, but it's nice to know I have the option to do so. 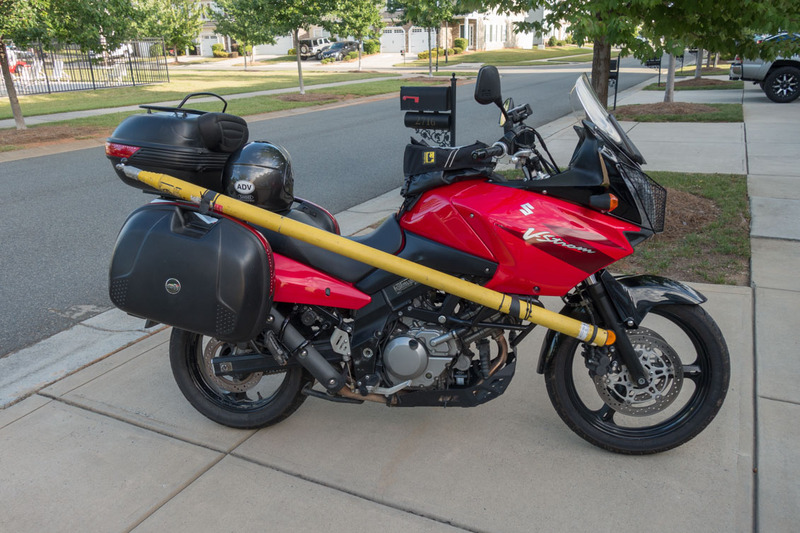 For those of you interested, I am offering my patented Pogo Stick Adventure Bike Mounting Kit (see Note 1) for sale. 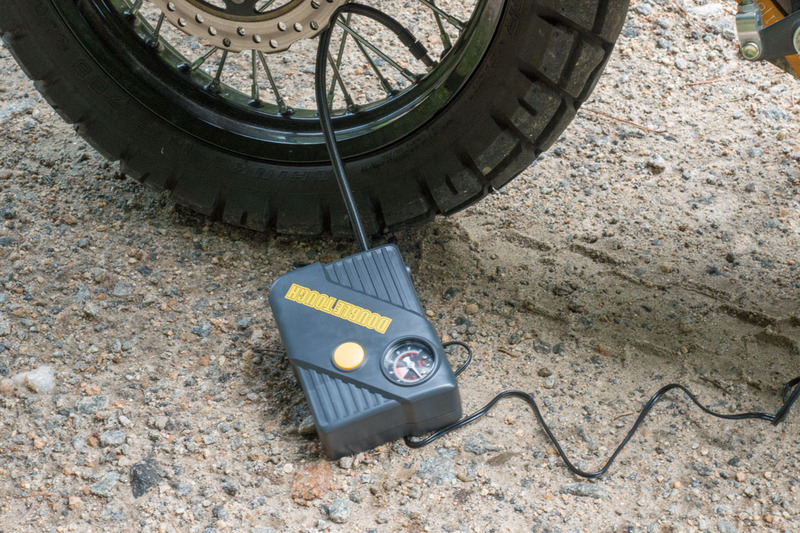 Version for V-Strom and KLR -- $150.00 (pogo stick and bar stool not included). 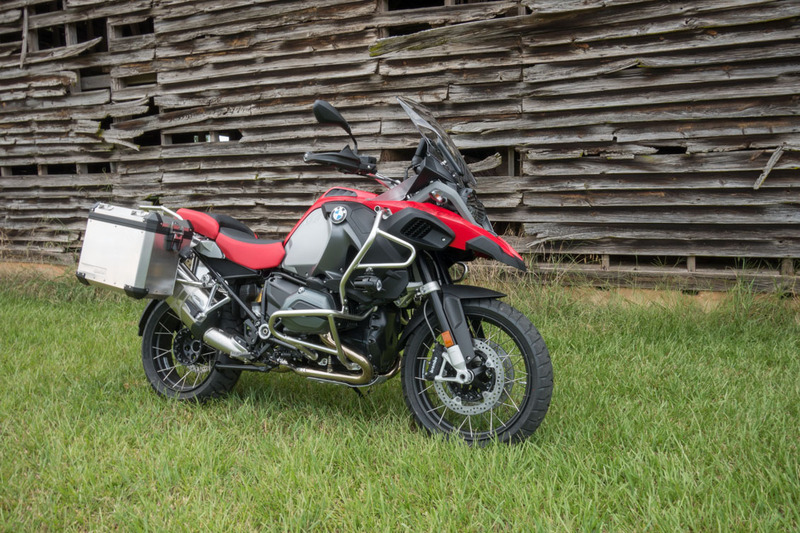 Version for BMW GS (all models) -- $275.00 (pogo stick and bar stool not included). 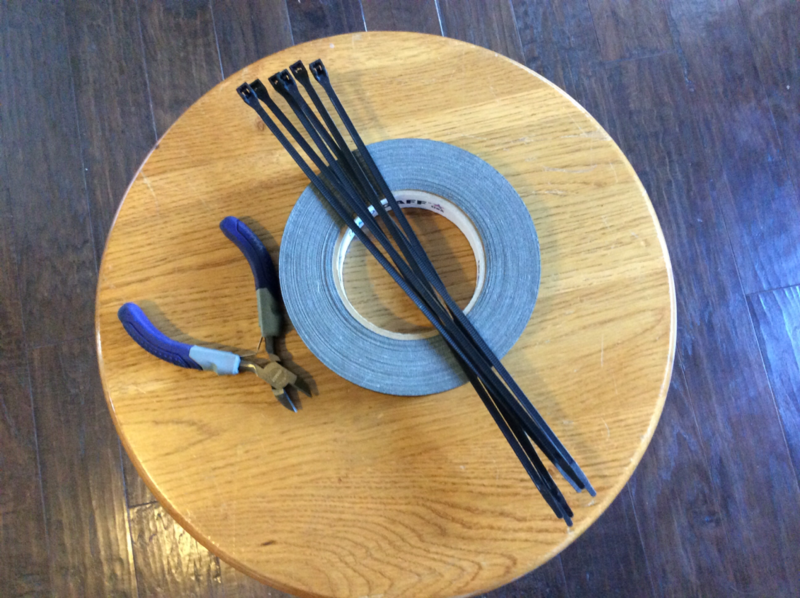 I am also working on a version for Harley's, but am having trouble sourcing chrome plated tie-wraps. Stay tuned. Note 1 -- Not intended for amateur rider/photographers. Use at your own risk. 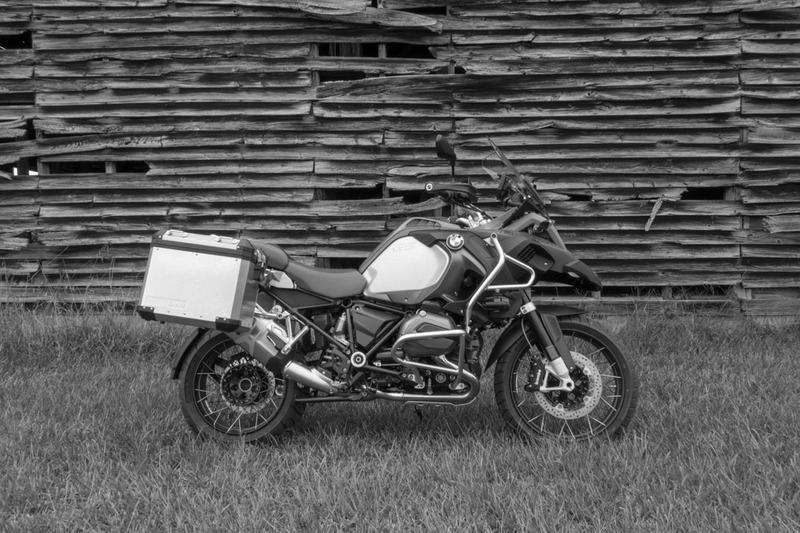 Consult a physician before beginning a regular adventure touring riding regimen. All sales are final. parallaxbill and B10Dave like this. Went for a short ride this morning with my wife. Grabbed this Western NC Tag-O-Rama! tag. 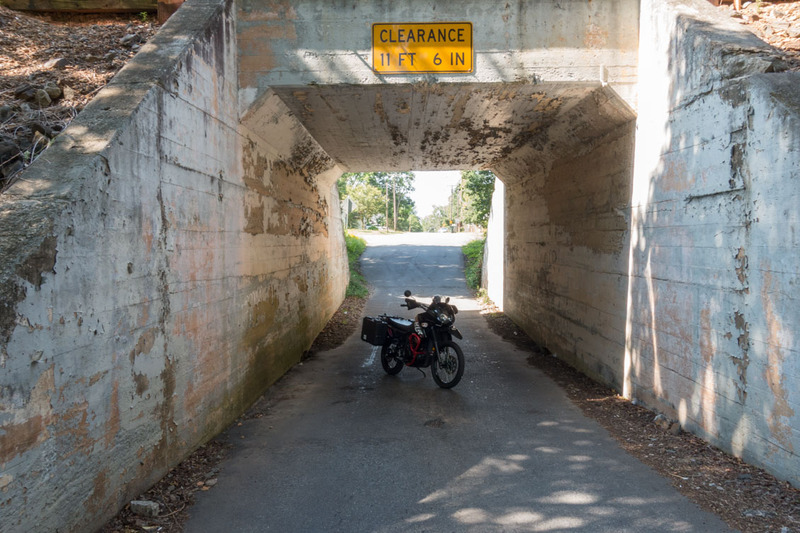 And then, using the Curvy Roads feature on my Garmin 590, found this spot to drop it off. parallaxbill, B10Dave and The Opa like this. 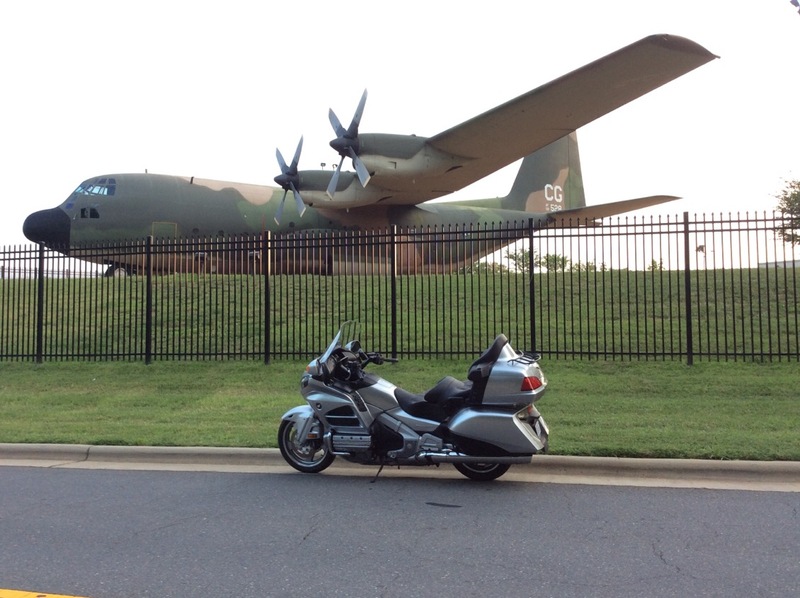 International Ride Your Motorcycle To Work Day -- I did! B10Dave and parallaxbill like this. 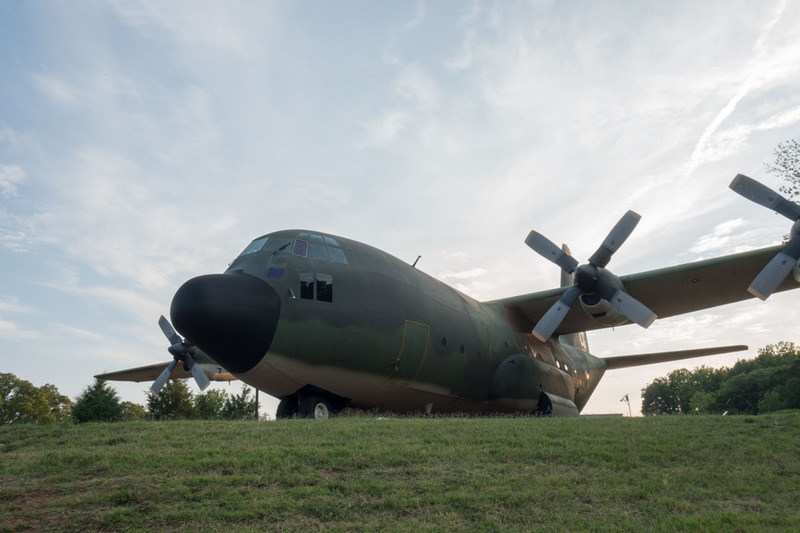 Have chased a few Tags this past week and shot some photos while doing so. 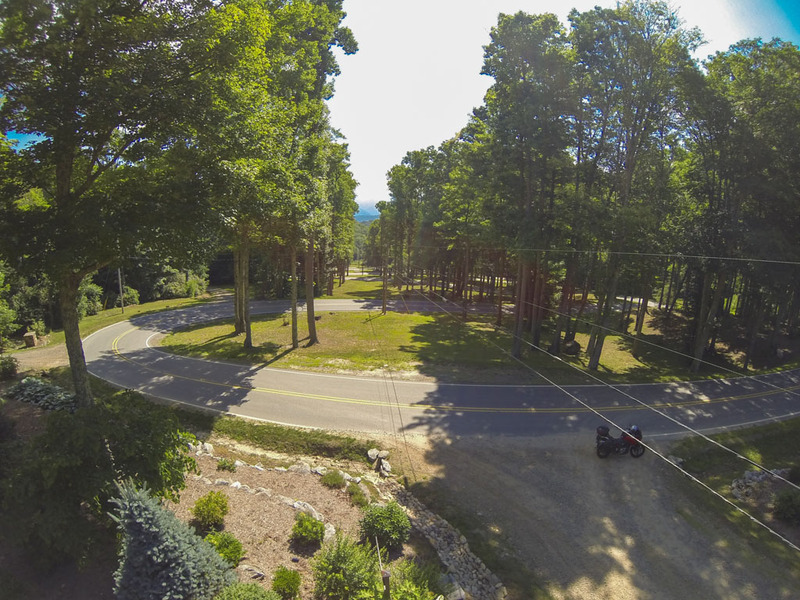 Talked over the layout at Hawk's Nest with our operations folks and came up with a safe way to set up the pogo stick for a photo showing the bends on Route 197. 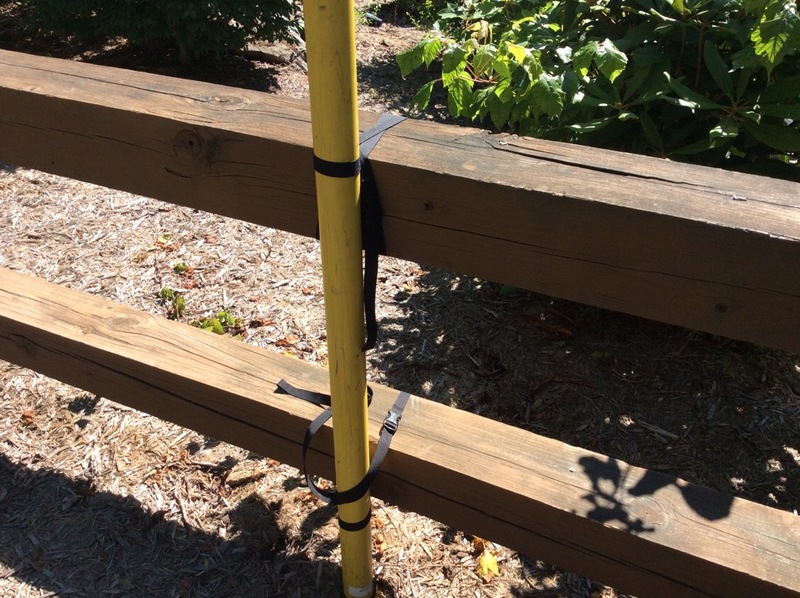 I rode up to Hawk's Nest today and lashed the pogo stick to the fence rails before extending the stick. That made it certain the pogo stick couldn't get out of balance and make line contact. Here are a couple of the resulting images. After I left Hawk's Nest, I headed down through Asheville to Franklin and then west while chasing after the Western NC Tag-O-Rama!, but got Bruced by my buddy Loren. Here's my "Grab" photo, that turned out to be too late. Wayah Road and FR711 leading to the Tag were both very cool roads. I turned into Wayah Bald to search for cell single and check out the view. 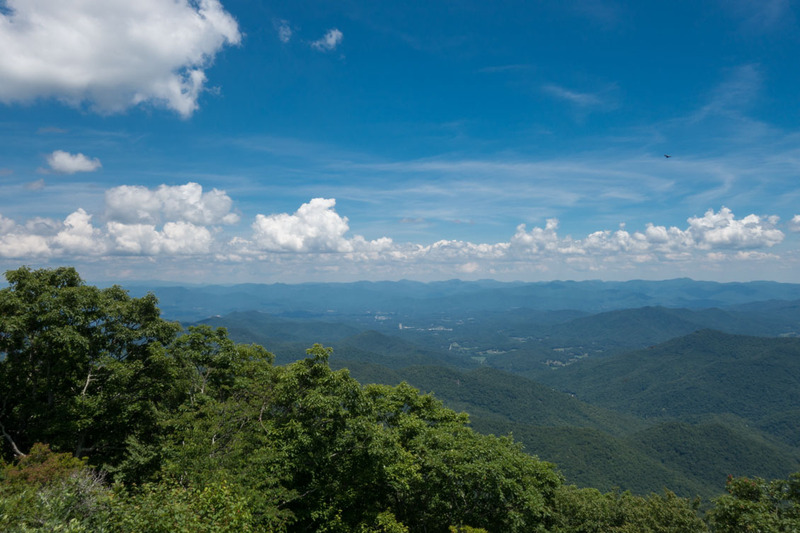 Here's the view from Wayah Bald. Followed Wayah Road northwest until it ended at Route 19. 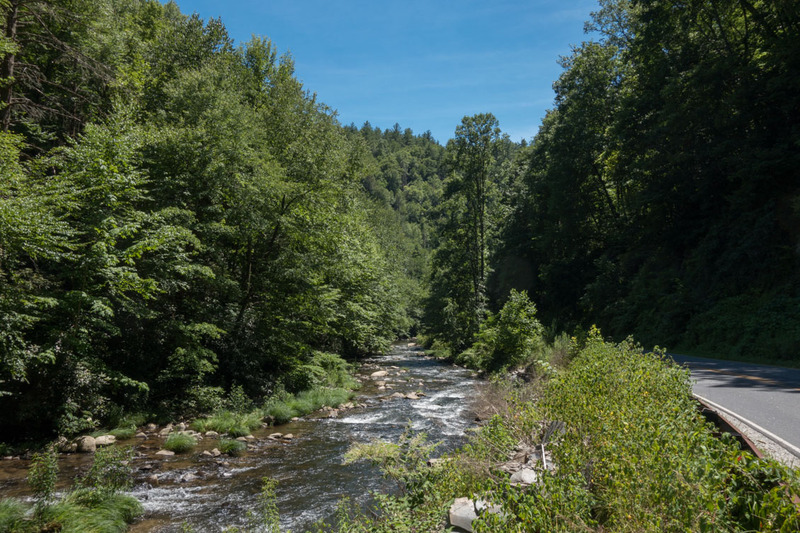 Here's a shot of Whiteoak Creek running along beside Wayah Road. Very nice day of riding! 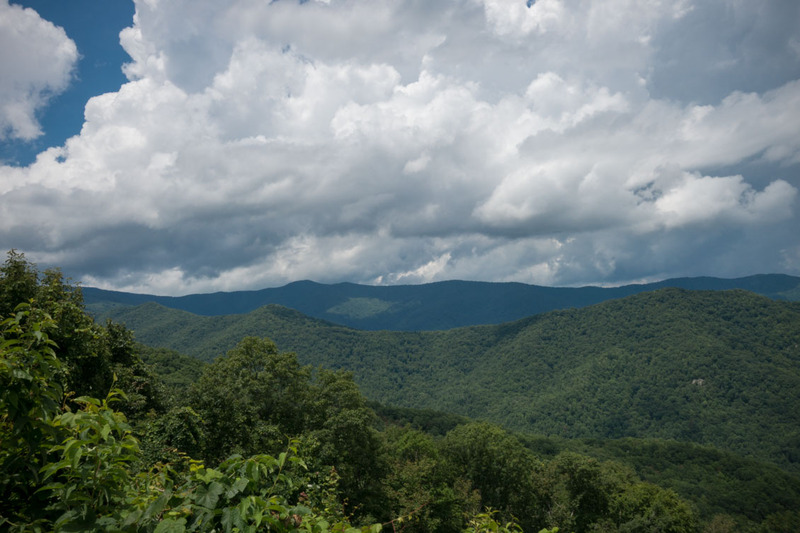 Got rained on for about ten miles in Asheville on the ride home, but it was otherwise nice weather all day. Logged 570 miles on my V-Strom today. B10Dave, The Opa and parallaxbill like this. 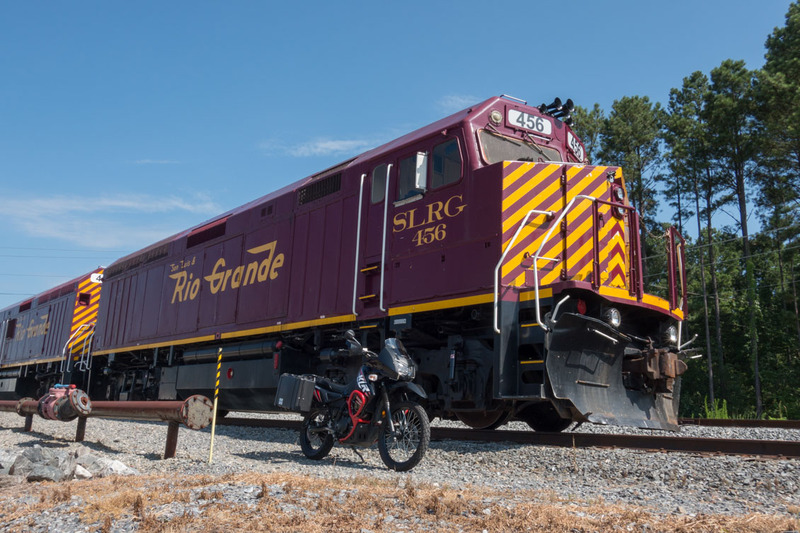 My son and I have a four-day ride planned that is scheduled to begin on Friday. 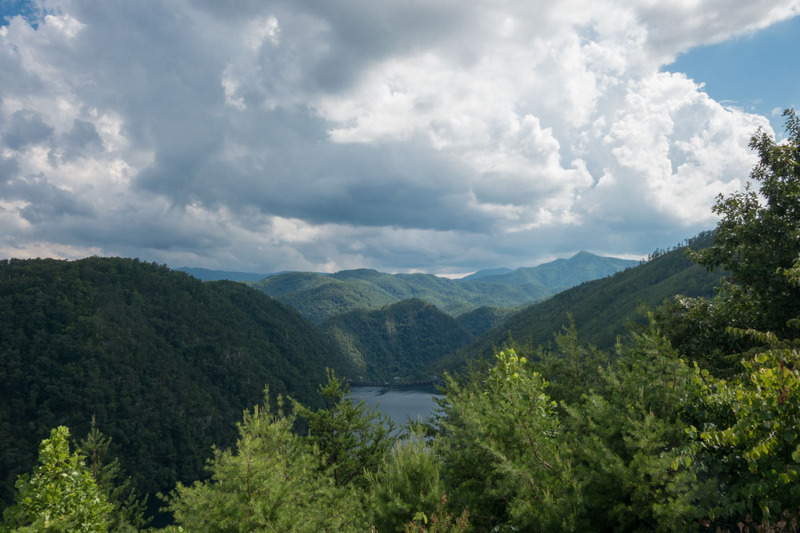 We're planning to ride out to Asheville and stay there three nights using it as our base camp while we ride in the area. 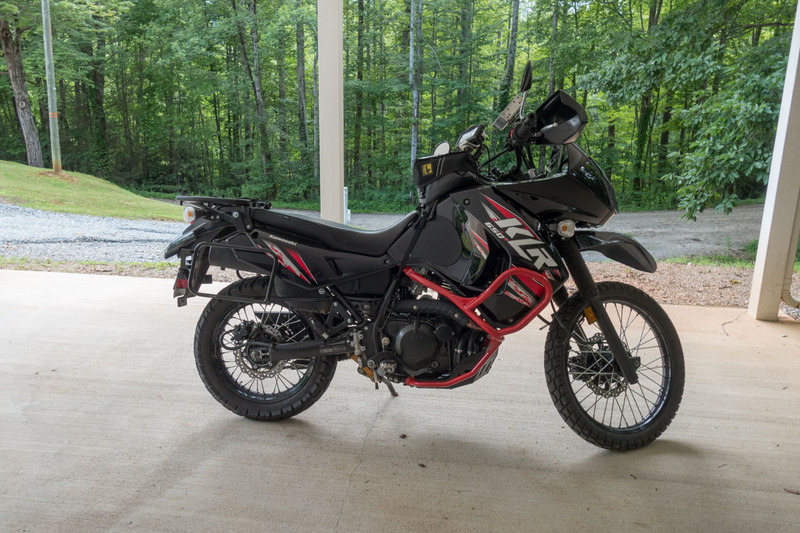 Numa Jr will be riding the V-Strom and I will be on my KLR. I will check over the bikes during the next couple of evenings while we watch the weather forecast. If the weather outlook gets too nasty, we will postpone to another weekend soon. parallaxbill and The Opa like this. We got off to a late start on Friday -- late to me, but not to my son who is a night owl -- and headed up to Morganton. 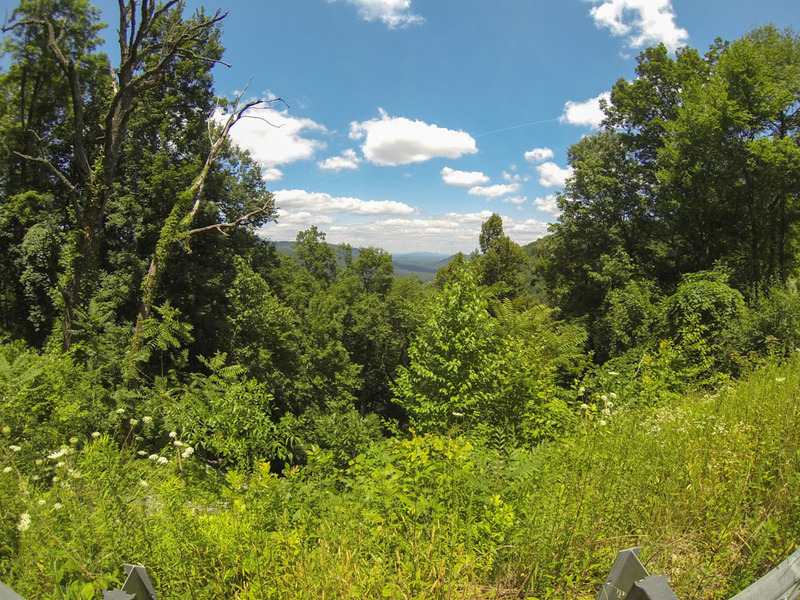 After grabbing some lunch in Morganton, we got this year's ride started in earnest with some dirt by traveling up Maple Sally Road. It had been quite some time since I've ridden Maple Sally and this was my son's first time doing so. We started encountering a fair amount of debris pretty early in the ride and then we came across a tree that was down across the road. We each had to ride over some limbs and then duck under the trunk to get past it. 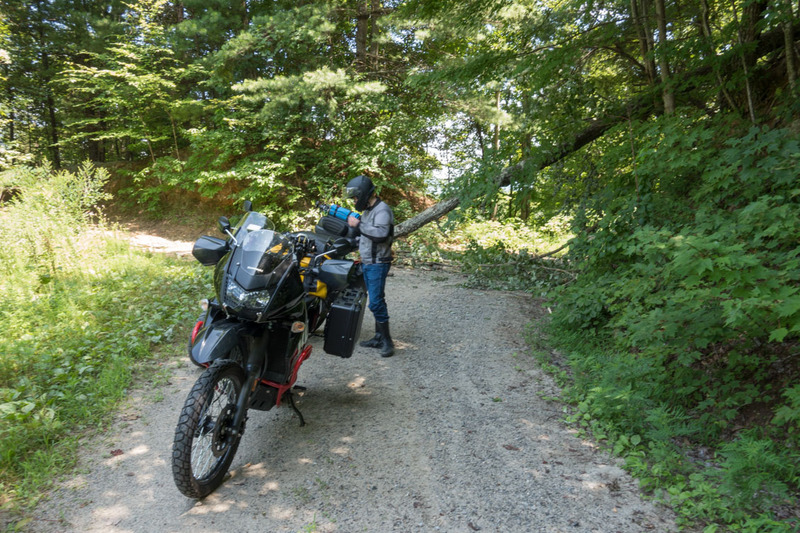 We continued up the road and found a second tree down across the road, but it was only approximately 8 inches in diameter and we both rode across it with no problem. 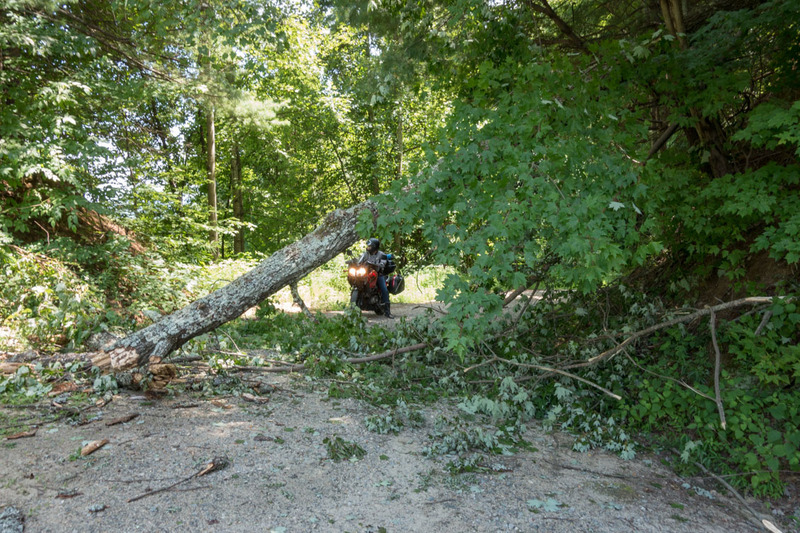 When we came across a third down tree, we broke branches from the top so we could ride around it skirting the edge of the road and a sharp drop off. 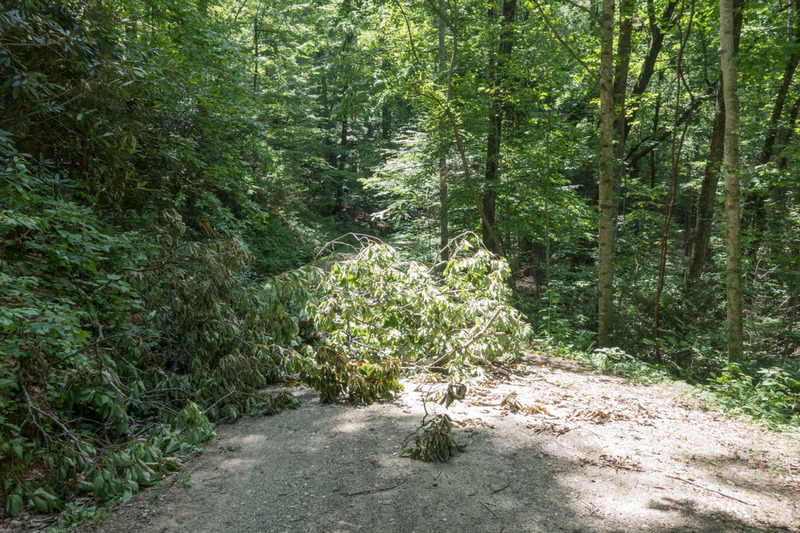 I started wondering at that point if we might come across a downed tree that would be impassible forcing us to turn around, but that third tree was the last one we experienced. As we got up towards the northern end of Maple Sally, it seemed to me like the road was getting muddy because my rear tire start squirming around. That didn't make sense because the road had been perfect all the way up -- no mud, but just enough moisture that it eliminated the dust. Turned out my rear tire was flat. As I got off the bike to look at it, we heard lightning and saw the sky starting to darken. I thought we were close to Maple Grove Baptist Church, but wasn't sure. I asked Junior to ride up the road and measure the distance to the church while I tried to get a little air in the tire. 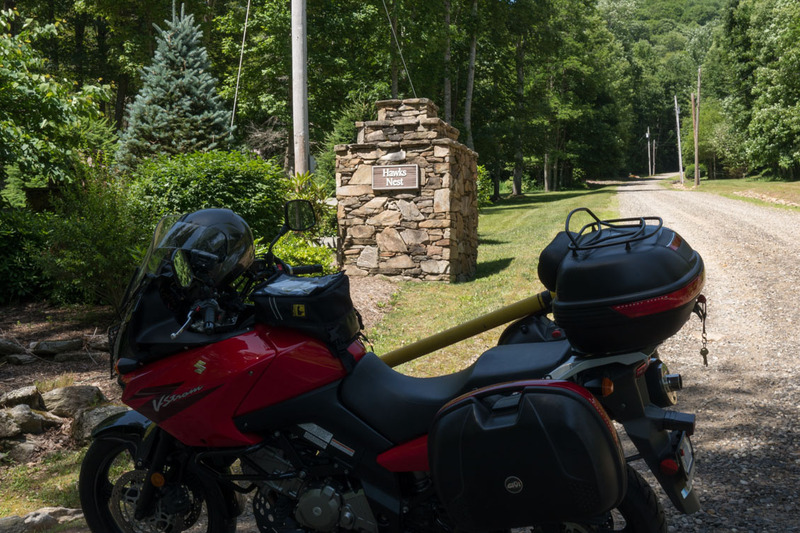 Maple Grove Baptist Church was only about 3 tenths of a mile away so I nursed the KLR up the road and under a canopy they have adjacent to the church. That would give us a dry spot to fix the flat. Here's the rear wheel up in the air with the KLR supported by my RRR Tools Moto Stand (thanks Gordon!). This was my first trail side tire repair and it was kind of fun working with my son to get it fixed. 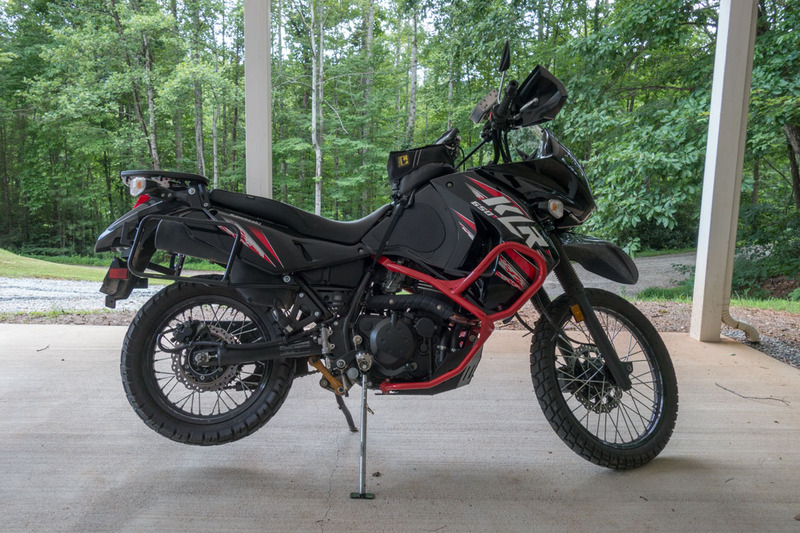 I had trouble getting a patch to stick to the small split in the tire, so we used the 21 inch spare tube that I carry to repair the 17 inch rear tire on the KLR. 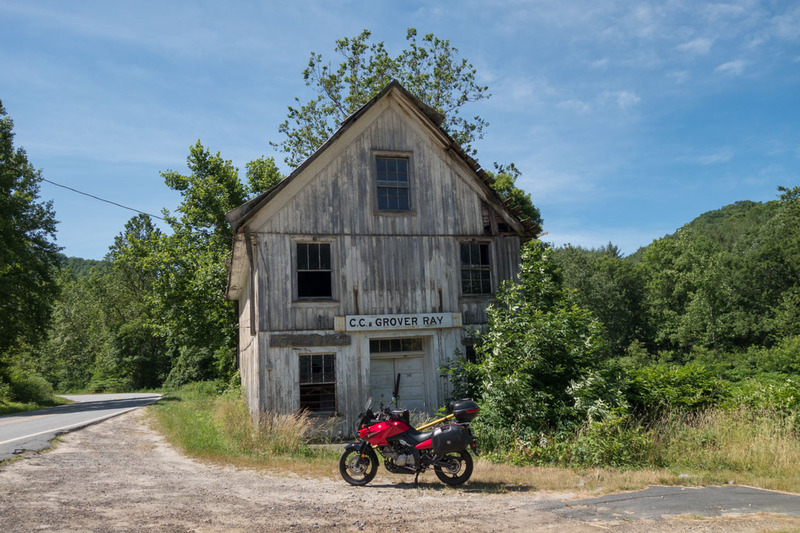 We turned left on Route 90 and then headed across Pineola Road and Old Mortimer Road before getting back on pavement and then riding to Jonas Ridge where we stopped for a cold drink. 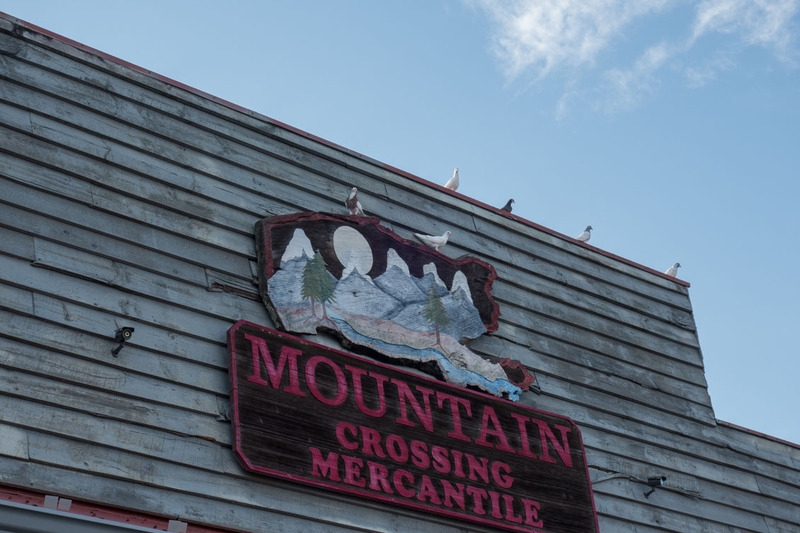 Saw these birds in the parking lot and they all flew up to the sign just as I got out my camera. It was getting late and we had a reservation for a hotel room in Asheville. 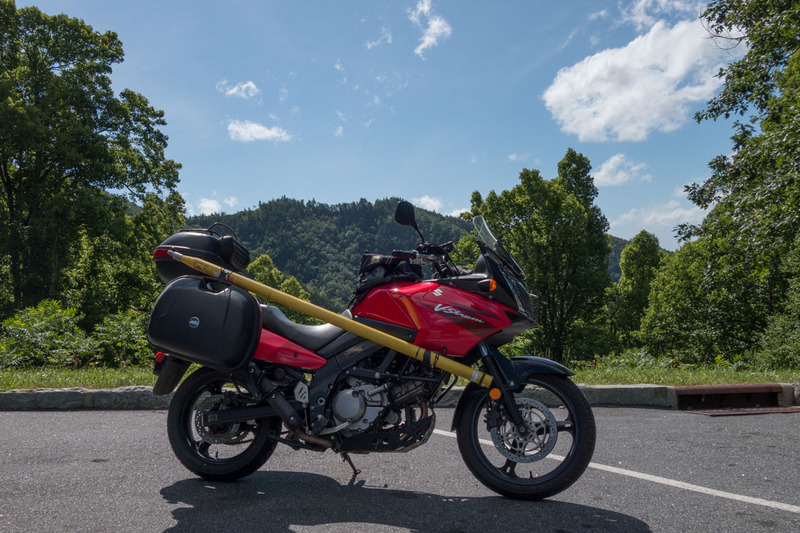 I didn't fully trust the repair using the 21 tube, so we decided to head down towards Morganton and use the Interstate to get to Asheville instead of riding the Blue Ridge Parkway as we had originally planned to do. About 8 miles north of the first commercial businesses in Morganton on Route 181, the rear tire went flat again. 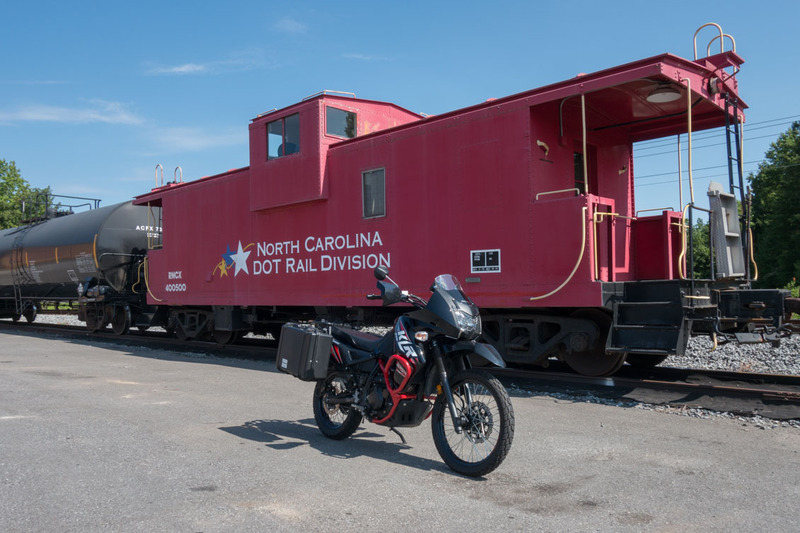 It would be dark soon so Junior stayed with the KLR while I rode into Morganton searching for a cell phone signal so I could try to rent a U-Haul truck. When I got to a gas station I found out all of the U-Haul dealers in the area were closed. I dialed up my buddy Augie, but before he could answer a guy drove into the station pulling a flatbed trailer with a riding lawn mower on it. 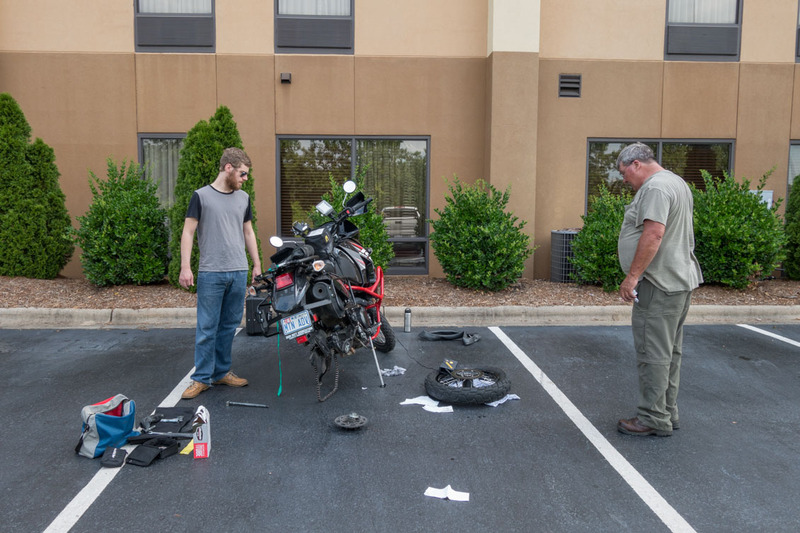 It had plenty of open space left over so I told him my predicament and asked him if I could pay him to haul the bike down into Morganton to the Hampton Inn. 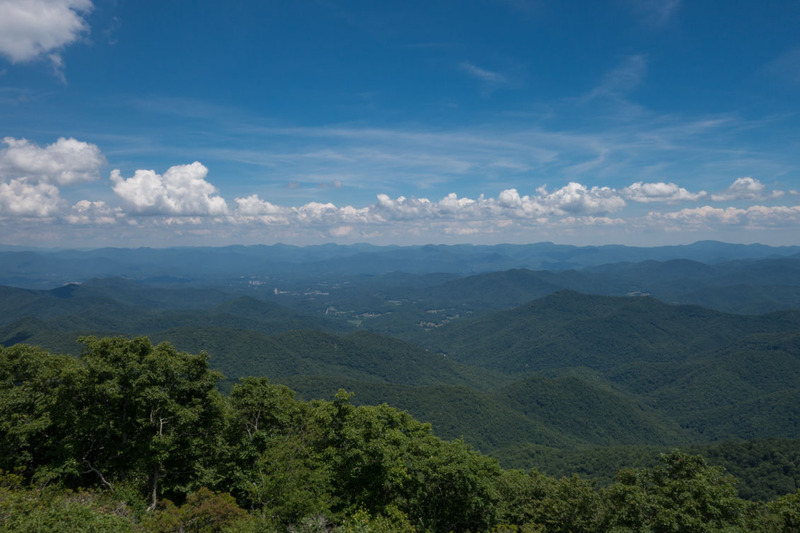 I figured we'd spend the night in Morganton, eat the hotel fee in Asheville, get the bike fixed in the morning and then continue on to Asheville. The gentleman agreed to help me, trailered the bike to the Hampton and refused to accept a penny for his trouble. Wonderful guy! Junior went into the hotel lobby to try to rent us a room while I got the KLR unloaded from the trailer. He came out with bad news; they were booked full. It was now dark and starting to rain so I asked the clerk at the hotel if I could leave the bike overnight and promised to return in the morning. We moved essentials over to the V-Strom and rode two-up to Asheville arriving at 10:30 PM after riding through light rain. Once we checked in the hotel and got stuff in the room, I saw I had a missed call from Augie. I tried him again, but didn't get an answer. 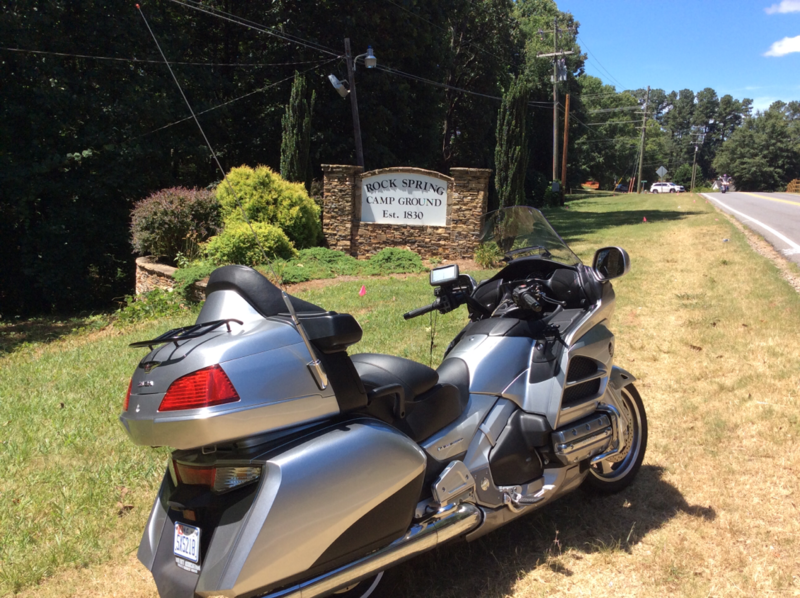 I searched the Internet for motorcycle shops in Morganton and didn't see anything that looked promising. 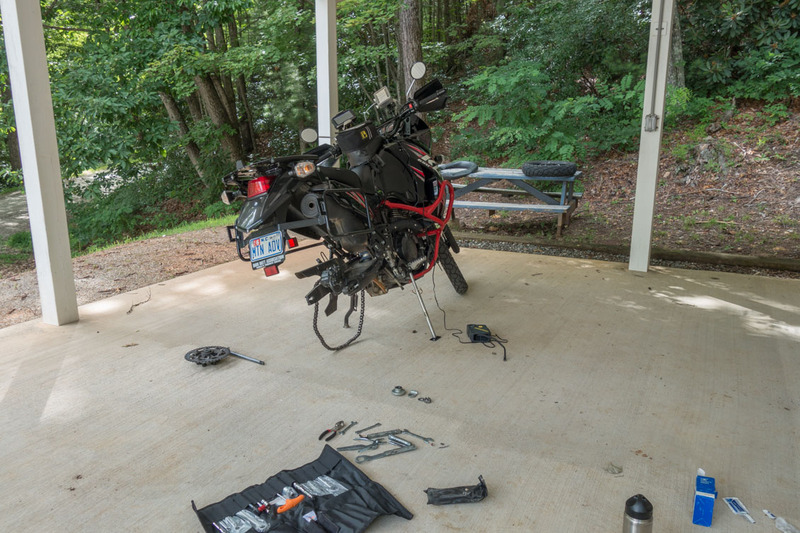 I decided to go to MR Motorcycles in Asheville first thing in the morning, have them retrieve the bike from Morganton and then have them repair the tire. I got up early Saturday morning and was getting ready when I got a call from Augie. He had been on the phone with a friend the night before (when I called) and he thought it was too late to call me back once he got off the phone. I told him what happened and that I planned to have MR fix it. Augie told me to save my money as he would be happy to ride up with a tube and help us repair the tire. 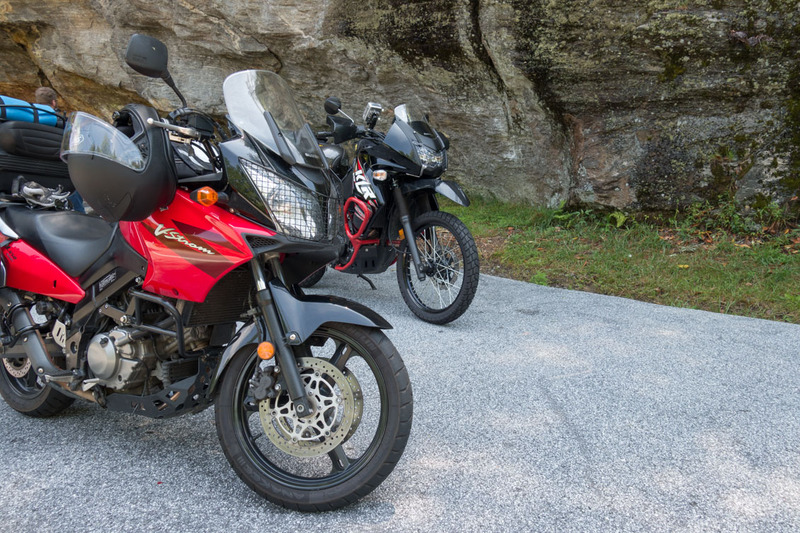 Numa Jr and I rode the V-Strom two-up back to Morganton and met Augie at 10 AM. MountainNate and The Opa like this. Augie seems like a heck of a guy. 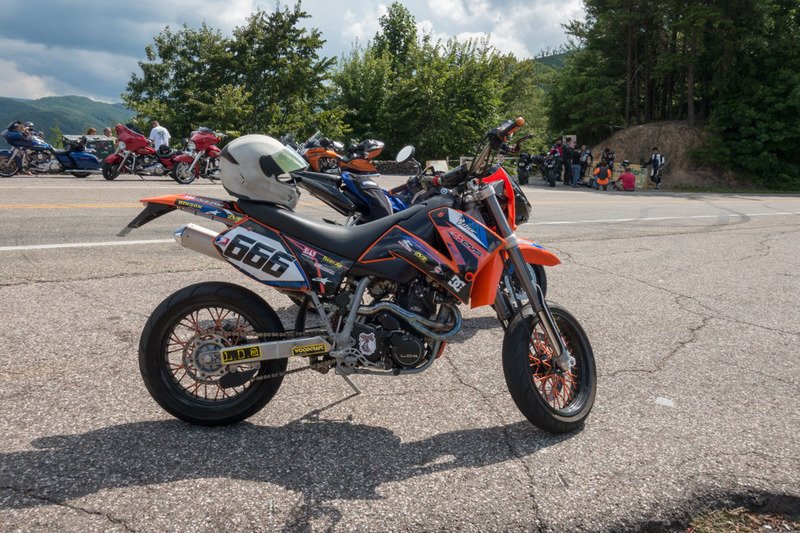 That was kind of him to volunteer to ride all the way to Morganton to help us get the bike back in running order. It was trouble-free after that; Augie helped save the rest of the trip. You make a lot of acquaintances throughout your life and, if you're lucky, a small subset of those acquaintances become good friends. I have been lucky enough to make some good friends since moving to North Carolina and I count Augie among them. B10Dave, The Opa and MountainNate like this. 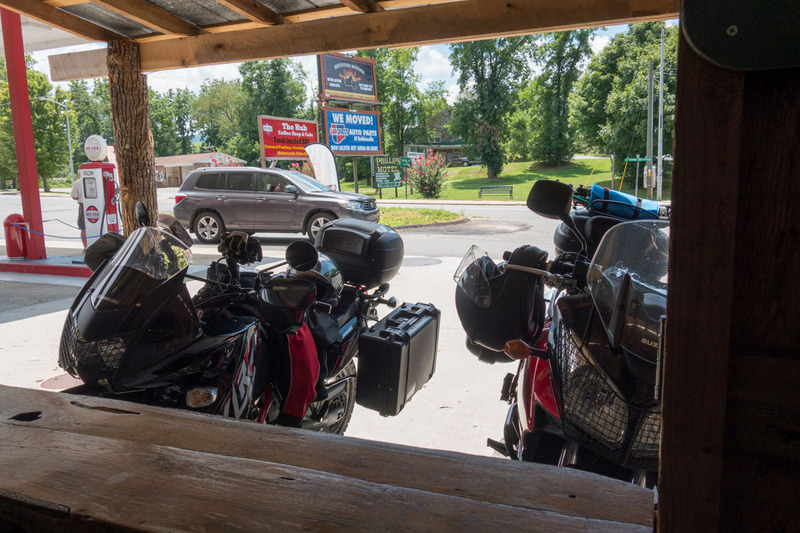 On Sunday morning we loaded up the bikes, checked out of the hotel in Asheville and moved our base camp to Robbinsville. After we got checked into the Microtel Hotel, we went out in search of lunch before heading for a ride and we ended up at The Hub. Nice parking spots to keep the bike out of the sun. Nice open air seating in the shade. I had a Cuban sandwich and Junior had the pulled pork sandwich. Both choices were excellent and we even had a view of the bikes from our table. 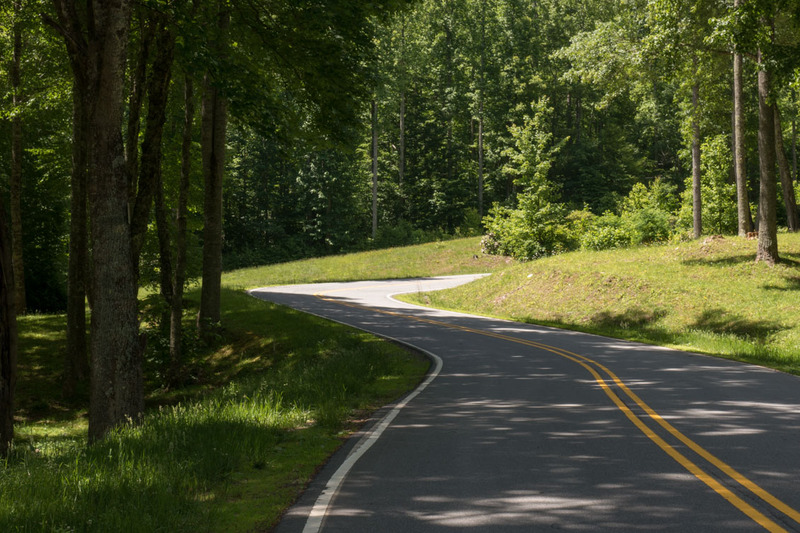 I had tried unsuccessfully a couple of times before -- once with my brother and once with Numa Jr -- to ride the Cherohala Skyway. The first time my brother and I got turned back because of heavy fog and the second time Junior and I ran into a severe thunderstorm. My third attempt was a charm. 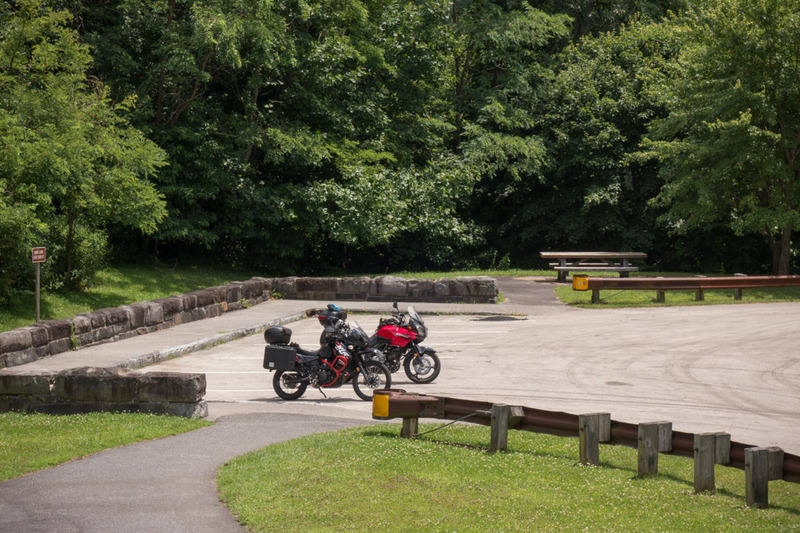 The bikes at rest up on the Cherohala. 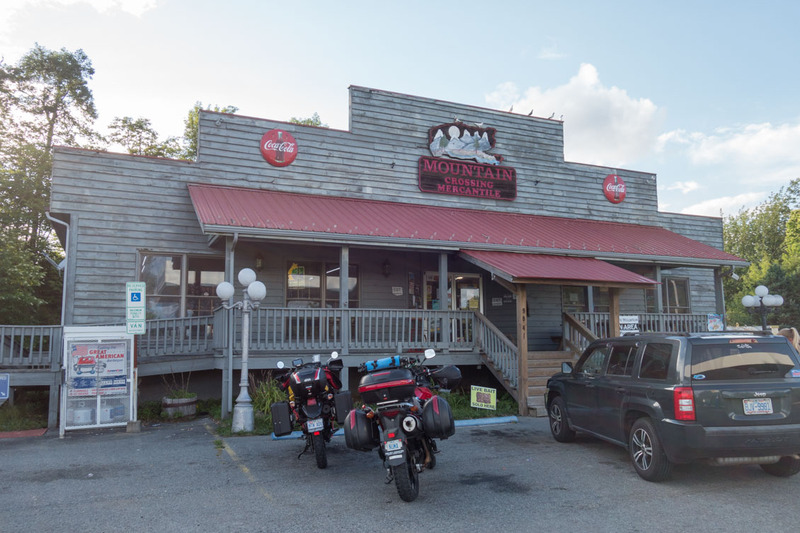 After we reached Tellico Plains, Tennessee, we rode up Route 360, turned northeast for a short distance on Routes 411 and 72 and then connected up with the northern end of Route 129 for the run south. 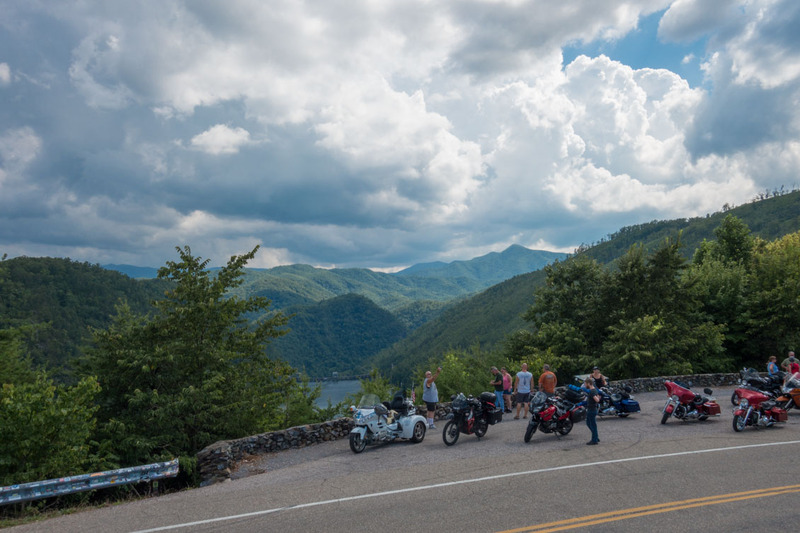 We rode down towards Deals Gap and stopped at the overlook before hitting the twisties. Delivering power to the people. 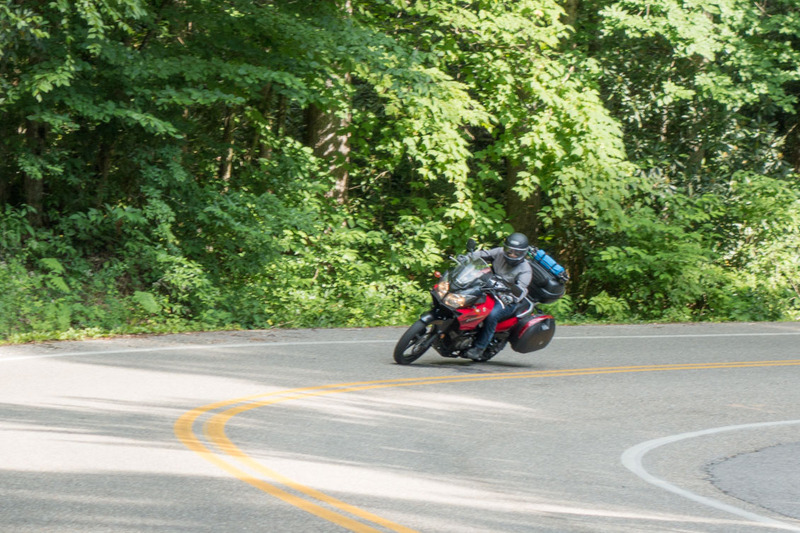 Numa Junior making a run across Deals Gap on the V-Strom. 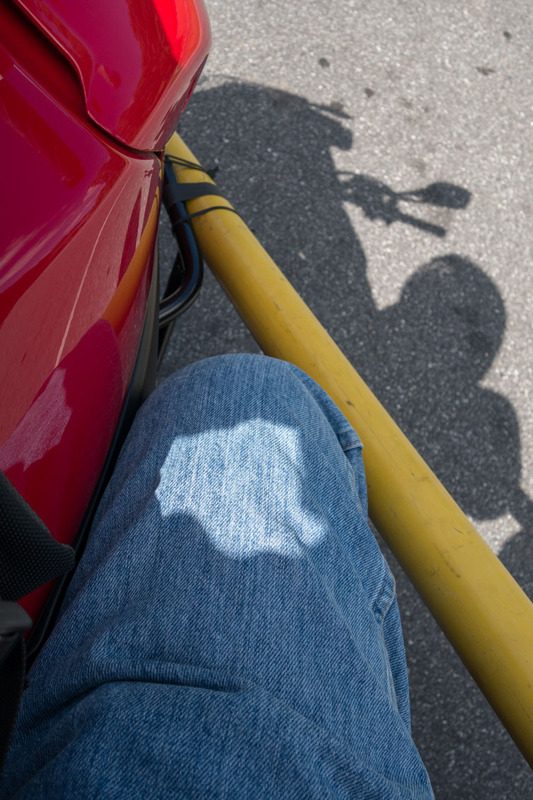 Junior was having so much fun dragging footpegs that he made several runs across the Gap before we headed back down into Robbinsville for a nice Mexican food dinner followed by cigars and good conversation from other bikers staying at the Microtel. MrCrisper, parallaxbill and The Opa like this. Junior slept in a bit on Monday before getting up to load his bike. A weather front was moving in as we headed out of Robbinsville. We took Route 143 over to Route 28 and then followed 28 all the way into Franklin keeping ahead of the weather so we got to ride on dry tarmac. 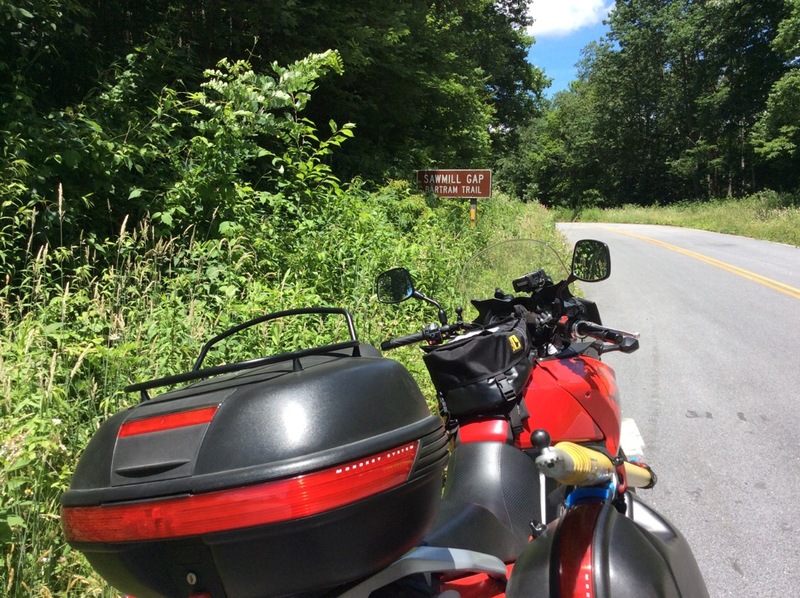 At Franklin, we turned east on Route 64 and rode it through Highlands and on to Brevard. Along Route 64 east of Highlands. 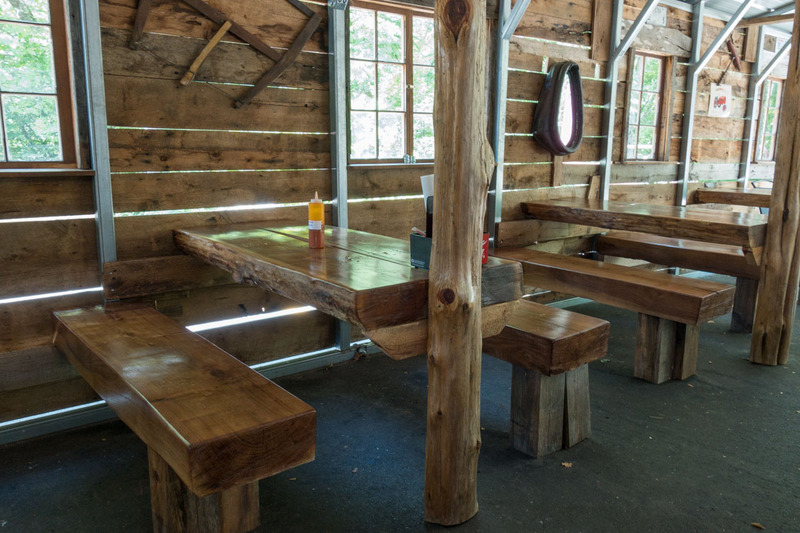 We planned to eat lunch in Brevard, but the restaurant we wanted was closed on Monday. The skies were getting darker and we could see lightning in the distance so we continued east on Route 64. 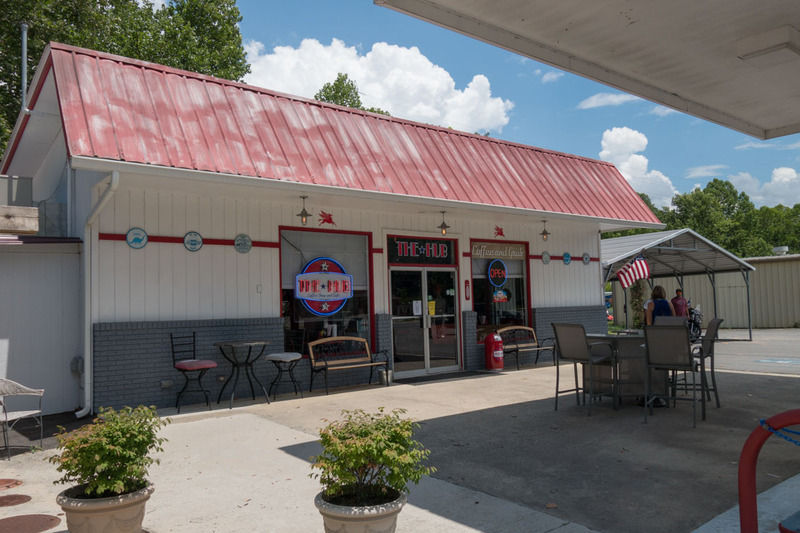 We got rained on as we headed out of Brevard and then we rode out of the rain before we got to Hendersonville where we stopped for a quick sandwich. Wanted to stop by Harper Cycle to look at Husqvarna motorcycles (their website says they have a new 701 Enduro in stock), but it was starting to rain as we came out of the restaurant. We jumped on I26 and followed it south to Route 74, then headed east to outrun the rain. 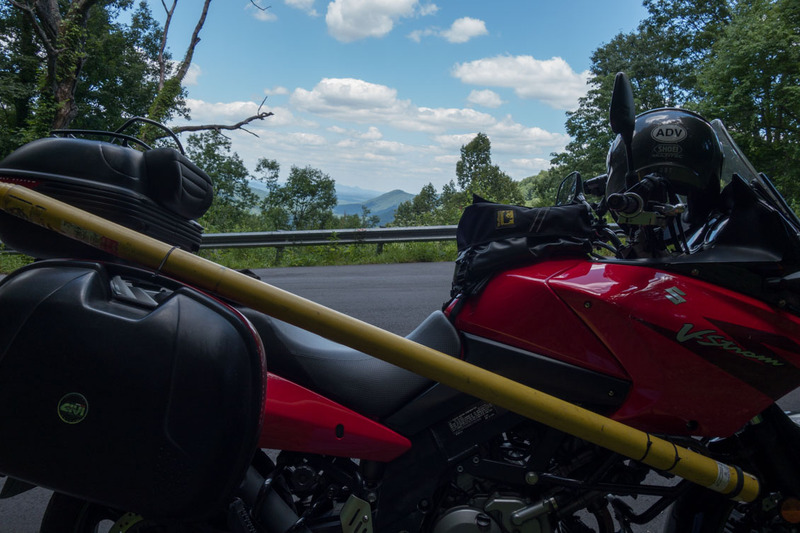 Got extremely hot once we rode out from under the clouds and into the sunlight so we made a quick stop to remove our raingear before finishing the run into Monroe. As a result of our trying to keep ahead of the rain on Monday, the camera stayed in my Wolfman tankbag for most all of the final day. Had a great time hanging out with my son and working with him to overcome the challenges we faced on the first day of this trip. 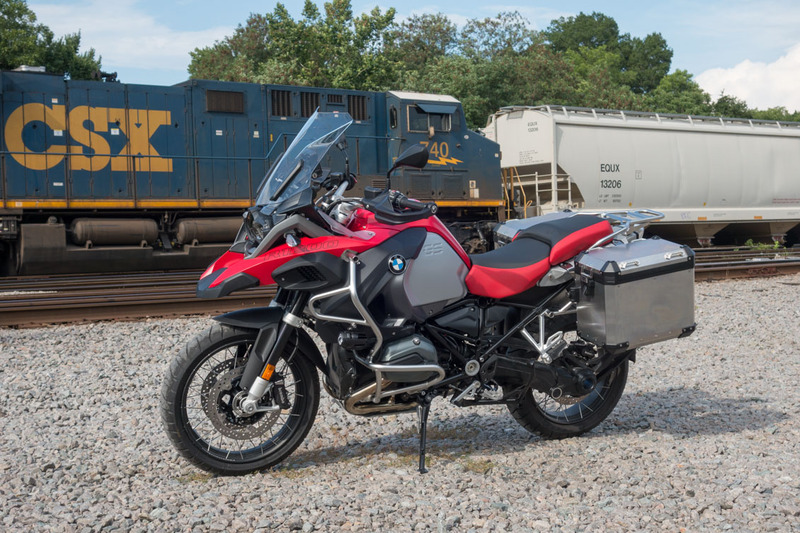 We're already talking about a year-five trip which will include riding to New Brunswick, Canada and then touring Prince Edward Island and Nova Scotia. My wife and daughter Jamie may even fly into Halifax to join us for a few days while we're riding around Nova Scotia. Numa, I was glad to be able to help u out, know u would do the same for me. Look forward to seeing u tomorrow nite at the dinner meet up at hawthornes. Sounds like u and Jr had a great trip. We did have a great time! I feel very fortunate that Numa Jr enjoys riding and that we get to take these annual trips together. 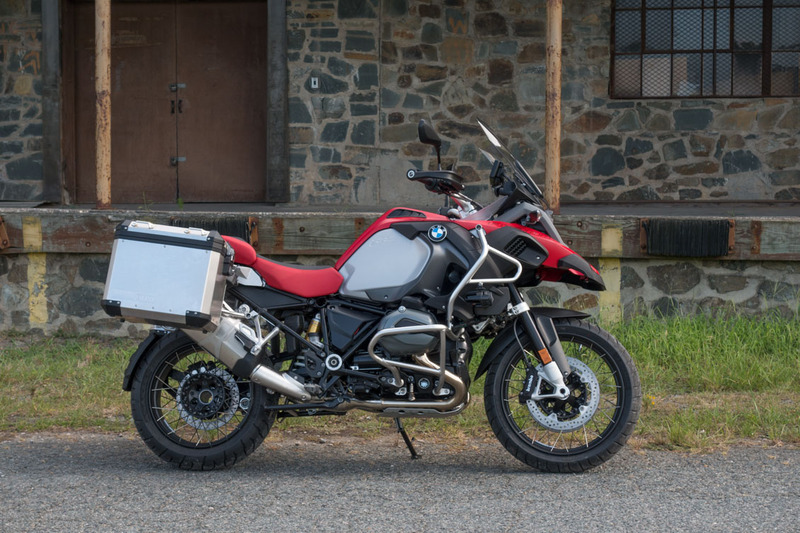 I have been researching options for adding a liter+ adventure touring bike to the stable and made a purchase decision today. Here are a few photos of my new ride. popscycle, Stens25, B10Dave and 3 others like this. Nice, I like the red.